Hello, when I change the sync schedule, the system preferences crashes. Any idea why this happens? I am running Mountain Lion OS X.
Hi, what version of the sync tools are you running ? I think main problem is because of the security setting of OSX Mountain Lion where it doesn't allow software (or system preferences) to be installed when the software developer is not known (see screenshot). I have upgraded to Mountain Lion while I had SMEstorage tools installed. 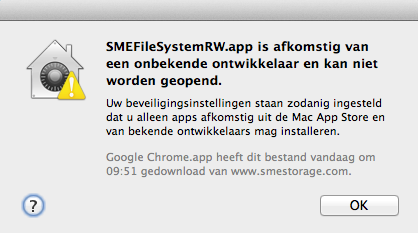 SMEFilesystemRW.app can't be opened because it is from an unidentified developer. I have changed my security settings to allow software from any source and now it is working. Actually we have not released a true Mountain Lion build yet. We have a demo version on our site but the full version we are going through some bug fixes reported after running the demo. The Mountain Lion version will be signed, but in any case even with the version you are running you should only need to change GateKeeper settings to install the App, once installed you should be able to put the GateKeepr settings back. Re the App Store build, we will be releasing an App Store build, but it will only be sync, not the Virtual Drive + Sync, due to the fact the Virtual Drive uses a third party component (OSX Fuse) which Apple does not allow.